Blueberries are best just by themselves. I would find it very difficult to have a packet of them out during service without scoffing a good proportion of them one by one while no one was looking. Yum! It would be guilt free snacking if I had paid for them : ) But you can’t really give guests just a punnet of blueberries for dessert. This dessert is so simple, universally pleasing to the eye and palate as well as being virtually dummy-proof . Place the cream and sugar in a saucepan and bring almost to the boil. Squeeze out excess water from the gelatine and stir into cream mix. Allow to cool 5 min. Whisk in the yoghurt. Strain through a fine strainer. Pour into dariole moulds and set 8 hours minimum. Preferably overnight. A little grated lemon zest and lemon juice. Place frozen fruit and sugar in a saucepan and over an extremely low heat allow to cook, stirring from time to time until the juice runs from the fruit and dissolves the sugar. Turn the heat up to medium and bring to the boil. Simmer 5 mins. Remove from the heat and add the fresh berries. Cool overnight. The next day, check the berry mixture for consistency as the pectin from the blueberries will have thickened the sauce somewhat, adjust with warm water if necessary. Taste the mix and add lemon juice and zest to your liking. Combine all ingredients to form a paste. Using a spatula, smear the mixture onto a silicon mat to form a shard. Bake in a moderate to slow oven until golden brown and crisp. While still warm, the biscuit can be manipulated into various shapes…use your creativity! 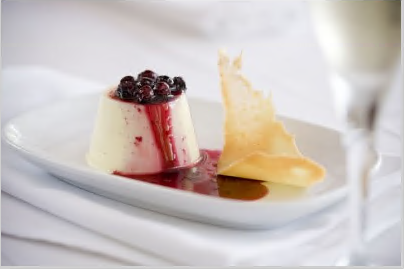 Pop the dariole molds of pannacotta into some hot water briefly. Spoon some of the blueberry sauce over the top and accompany with a biscuit.